Tuesday Tribute: Charlie Thorn | Andrea Works . . .
Andrea Works . . .
[A NOTE ABOUT “TUESDAY TRIBUTE” and it’s beginnings]: a few weeks ago my mind went off a-wandering during my run. As it often does, it strayed into the realm of songs I’d rather not play on repeat, what the weather might be like today, did that car just wave at me, and wouldn’t-it-be-cool-if ideas. Ideas like Facebook memes. I thought about how nice it is to see gratitude posts directed at a certain person or community, someone that made a difference even if they didn’t know it. I thought about those 52 week challenges to leave little notes for strangers or smile more. I decided on a new challenge for myself: I will take every Tuesday to highlight someone from my life, past or present, who has changed my outlook or given me reason to make a positive change. There is only one guideline, and one caveat: First, I must have interacted directly with this person. Authors or public figures that have had positive effects in my life are not candidates if I do not know them well enough to call them an acquaintence. They might collectively have their own post(s) in the future, but this series is for my direct circle. Second, those I choose to highlight are in no particular order. There is no implicit hierarchy or chronology. That is all. 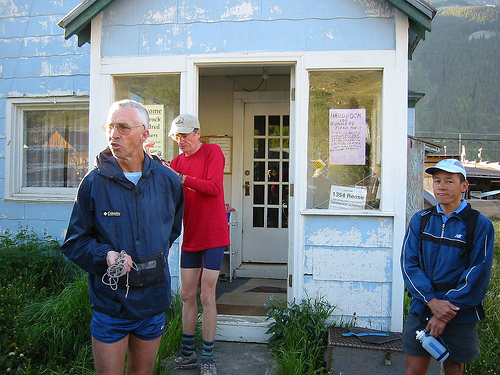 Charlie Thorn, in front of his house, gathering for trail marking. It was 1998 and I was an avid participant in this email group called the Ultralist. I had recently started doing 50Ks back in the Midwest and now, living in Albuquerque, I was jonesing for good trail running and connecting with whatever ultra community was around. Trouble is, there wasn’t a lot in the way of races in New Mexico. Like, none. Sure, there were trail runners, ultrarunners, and lots of trail fun runs – you just had to find the right people to hear about that stuff. Up in Los Alamos there were a bunch of folks who thought about two things: physics and ultrarunning. One of them owned a house in Silverton and went up there a lot to run and stuff… that’s as much as I knew. On the Ultralist came a notice of some trail work being done in Silverton over Memorial Day weekend. I had nothing better to do, so I contacted the guy organizing it, Charlie Thorn, and he offered me a spot to crash at his house, even. Off I went, into these totally new-to-me mountains north of Durango, and had quite a hard time actually finding these guys as they did trail work. Luckily I found them the next day (Sunday) as they were constructing a totally new trail for some ultra event that summer. That trail was the Nute Chute (named for Chris Nute), and it removed a few miles of road from the course. That course, of course, was/is the Hardrock Hundred Endurance Run, and Charlie was one of the founders of the event. On that Sunday – and the next day when he and his wife Andi Kron took me up to Cinnamon Pass half on bikes and half on foot – Charlie told me about Hardrock. I was impressed, obviously. The run didn’t fill up in those years, so Charlie told me I should enter. I thought he was joking at first, and then completely nuts. Had I entered then, who knows what would have happened with my Hardrock “career”. I ended up pacing a new friend instead for about 40 miles and had a really enjoyable and tough time. Sometimes I think Charlie wanted me to enter to see how badly I would blow up. With aid stations and support, I wouldn’t have been in danger, but it might have been an interesting experiment. Charlie, in his many years on the Hardrock board of directors, has been a voice of reason, humor, snark, and sanity. He has a boatload of Hardrock finishes – TEN, that’s 1000+ miles of Wild & Tough! – and has arguably spent more miles on the course than anyone else still traipsing the trails. Join more than 1000 AndreaWorks followers - receive posts via email! Sorrentino Dental Blog A Dentist who “gets it”. Too bad he’s in New York. Sunscreen Ratings Find Sunscreen that works and won’t hurt you! Domains from NameCheap This is where I register all my domains – buh-bye, GoDaddy! Food Lover's Guide to New Mexico I wrote this book to help YOU find awesome food in New Mexico. Precision Nutrition System A ridiculously practical guide for changing your food relationship. Affiliate link.